Ethnic by Outfitters winter dresses 2015 for women have launched just now. The collection is consisting of readymade printed dresses. Each dress is looking beautiful in lovely color combination. The stitching styles of these dresses are simple but modern. You will find knee-length shirts, cigarette pants and dupattas in this collection. You will also find these dresses in unstitch pattern from their outlet. The dresses are really attractive and stunning. Just wait a bit here and have a look at this beautiful collection of Ethnic by Outfitters winter dresses 2015 below. Ethnic by Outfitters is the most famous and popular fashion brand in Pakistan, who offers ready to wear and unstitched dresses for women only. Their every collection is full of with modern and elegant dresses. They offer eastern wear dresses for girls which are design with great fusion of western looks. They offer casual wear to prêt wear dresses for women. Recently, Ethnic by Outfitters has launched their winter collection 2015. This collection is consisting of prêt wear dresses in simple looks. Each dress is embellished with pints and attractive color combination. The colors you will find in this collection are black, blue, brown, green, orange, red and many more. All these Ethnic by Outfitters winter dresses 2015 are eligible for young girls. You can war them as casually and in parties also. 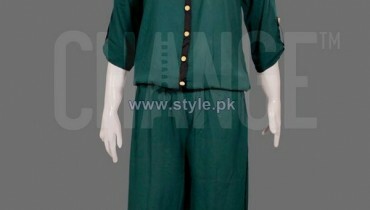 The knee-length shirts, cigarette pants and dupattas are added to this collection in linen and chiffon fabric. Ethnic by Outfitters winter dresses 2015 are stunning and catching. For further queries you can visit the Facebook of Ethnic by Outfitters right now. You will love this collection because they are beautiful and stylish.